The U2 – that’s “U-squared,” for Urban Utility – made brief appearances back in September 2014 at a private panel discussion in San Francisco; and at a world fair in New York, but was now ready for the auto show scene with a stop in Toronto. 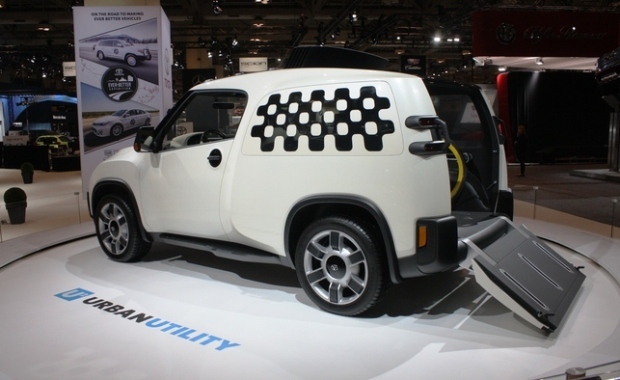 Not as tall as some current production utility vehicles, the concept appears to take the shape of a cross between a cargo van, truck and passenger car. And if that design doesn’t make it stand out, another oddity is found in its white checker-box design on the back body panel. Looks aside, what Toyota really wanted to showcase here was its versatility and functionality. The U2 Concept features a retractable roof panel; rear glass that can slide into the tailgate; and a versatile interior rail system. Rear seating can be folded up, and if you’re in the need for more space, the front passenger seat can be fully removed to open up room for work and play. Loading and unloading has been simplified via a fold-down tailgate that can also act as a rear ramp. “As a company of makers, Toyota has been driven by a passion for designing and engineering practical solutions to meet the ever-changing needs of its customers,” said Cyril Dimitris, Vice-President of sales at Toyota Canada. The U2 Concept is on display to showcase a new vision for the urban entrepreneur who’s looking for versatile mobility on a smaller scale. Maximum space utilization seems to be the key for this vehicle, which can transform its internal shape to fit many needs. On display at the CIAS, show patrons got a little glimpse at the interior with all of its seats removed, save for the driver’s. Inside were several bits of chrome trim, one of which was apparently designed to hold a clipboard, as well as an iPad-looking screen for infotainment. The model’s example cargo was a bicycle and two skateboards, which left plenty of space to spare. At this point, the U2 is only a concept vehicle, and it’s not expected to take on current production models like the Ram ProMaster, Nissan NV200, or the Ford Transit and Transit Connect. The Toyota U2 Concept will be on display at the CIAS from February 12 through 21 at the Toyota booth, alongside the 2016 Prius, Rav4, Tundra and Scion iM.